Jim has his STCW95 Sailing 200 tons Captain´s Licence (Sailing Yacht Master). He also has his PADI Dive Master with more than two hundreds dives. His two kids are divers and sailing lovers too. Send us an inquiry to get specific pricing for Sasha. We can’t begin to thank you enough for the amazing time we had this past week. Everything was perfect! The food was absolutely delicious, the scenery was beautiful and the company was fantastic. We really enjoyed the entertainment (Magic shows) too! We made the best memories that will last a lifetime! You wer both so attentive and hospitable and made each day special! Thank you for everything! It was an amazing trip! Come to visit us anytime in Houston. Thank you for a magical trip! We are nos an accomplished diver and an accomplished snorkeler... thanks to you! When you spend your time looking after family, it is such a treat to be looked after and you have made us feel very special. Thank you! Unbelievably friendly and accommodating. I felt like we left with them being our friends. They are great people and did whatever they could to make us happy. Very clean and very comfortable. Oh My Gosh!!! The food was amazing! Better than anything we could have expected. Three great meals a day. Fantastic. It was perfect. They customized the trip just for what would work for us and our kids. They nailed it. It was perfect. Jim and Silvia are amazing people. They worked endlessly to make this the perfect vacation for us and our kids. Every time we though there was nothing more they could do for us, they surprised us with a new and interesting thing. Three delicious meals a day. Every day the food was different, delicious and incredibly presented. Magic tricks and jokes at night that the kids thought were amazing. Fantasttic Scuba teachers. They were patient and extremely good with teaching us how to scuba. Incredible sailors. We never once felt in danger. They always had everything under control. Anchoring was apiece of cake to them. They are extremely comfortable with their vessel. they chose great wines every night. The bar was always open and the beer was always cold. They know the BVI and the USVI like the back of their hands and took us to many really interesting places. Most importantly, at the core, they are truly nice people. They are kind, hard working, very considerate and always trying to make our experience the best that it could be. They are well beyond perfect. I can not give a higher recommendation to anyone. Thank you for sharing your home with the 6 of us! Perfect week started with a hime cooked meal, disco dancing lights and joke telling. The BVI´s are gorgeous and your hospitality was outstanding. We hope to see youa gin! Thank you from the bottom of our hearts. What a very special and lovely trip around the Islands. Each meal was better than the next... Lasagna, ribs, pancakes and omeletts... painkillers!! Thank you for setting up the best dance parties around! Your light show is the best! Most importantly we loved getting to know you and Sylvia so well. You are kind friendly and the hardest working couple I know. Thank you for a very special week in BVI. We appreciated the great food and service. We loved Jim´s stories and magicy and Sylviia´s smiles and sense of humour. were great. We felt very much at home all week. You are a very competent and patient crew with no challenge or adventure deterry us from having a great trip. We feel we have met friends. Thank you so much for sharing your beautiful Sasha and your hospitality for the last week. As you know we came to celebrate a special event Dales birthday and were blessed by ANOTHER event... the engagement of Ashley and Shane on FJ Beach. You made BOTH celebration as well as every other days spectacular! Can´t leave without mentioning the food... just terrific all week! Thank you again for everything. Hope to see you soon again. Where the accommodations and general condition of SASHA satisfactory for your charter party? Absolutely lovely and perfect in every way! All of the above and more! Jim & Sylvia worked constantly to ensure everything exceeded our expectations to the smallest detail! Five stars food with five stars service! A great variety ALL DELICIOUS ! It really exceeding our expectations! Jim & Sylvia were the main reason for that! We wanted to take them home with us ! Please share any additional comments or suggestions you may have here. Thank you all for a stellar experience! We celebrated a milestone birthday, a surprise engagement on this trip. What a beautiful experience for our family! We appreciate you helping us make it happen! Everything was even better than we had hoped for. We so apporeciate everything you did to make our week so special. The food was delicious, you found great beaches for the children and lots of great snorekling spots for all of us. You were always willing to accommodate the kids requests and your flexibility made our vacation so relaxing. I think Nicholas will always remember being allowed to sail the boat (and I will always remember your bravery in allowing him to do so!). We had a fabulous trip. Both the captain and Carol were excellent. We covered a lot of ground - I think we snorkeled about 15 times along with man opportunities to swim, kayak and paddle board. We also did some nice sailing and went ashore a couple of times. The captain had a great itinerary planned and was very efficient with the timing of activities and sailing. Carol’scooking was excellent. They both made the trip just wonderful. The captain downloaded all of his underwater Go Pro footage and his drone footage to memory sticks before we left - a very nice touch. I would totally recommend Sasha for a charter. Carol and Jean Yves Thank you for a lovely cruise. This week has been one highlight after another. from the field to the islands we visited, tot he great service you gave us! We saw amazing crabs, star fish and being salvaged! We loved the jokes with dinner. Once again thank you for the memories Merci beaucoup! We had an absolutely fantastic week onboard Sasha with Kate and you. We would love to be back in some years. Please let´s keep in touch, and cross our fingers that it may come true. Flight back home was good. We’ve been busy with our family. So excuse me for answering this late to your email. Once again we are super happy we did this trip with you. As I mentioned in the book, you are an exceptionally professional captain and atthe same time a caring and polite person taking care of every little details during our journey. You and Aurora are very good hearted people and that made our trip a pleasant adventure. We were very comfortable and enjoyed every minute of it. It was too short !!!! We had lots of fun. To me it was very special spending the holidays with my son and the fact that I could resume again scuba diving after all of these years has been the high light of my trip. Thanks to you I felt very secure and truly enjoyed each immersion. Next time St. Vincent and Grenadines !!! Wishing you and Aurora a blessed 2018. Kindest regards, Carolina and the whole family ! Putting this week in to words is difficult except to say perfect in every way ! Sasha being our first charter none of us knew what to expect, but Jim and Sylvian mad sure this week was beyond anything we could have imagined. It will be very emotional leaving this day because we truly feel as though we will beleaving part of us on board Sasha and leaving two very good friends as well. We will be back to do this again and it will be with Jim and Sylvian! Jim and Sylvian thank you for the greatest week of our lives! Good sailing to you, my friends! This week was truly amazing, but wouldnt have been the same without Jim & Sylvian! You guys really made this a special week for us. I due mynew love for scuba diving all to you. I hope Iget to see you guys and Sasha again. If there isa heaven on earth, it has to be Sasha. We have had perfect meals, have seen beautiful beaches and so much incredible sealife. Also, Jim and Sylvia are two angels. They are so kind and cant do enough for you. Our kids want to be adopted by them. We will beforever grateful to them for giving us the best vacation full of memories! Lots of good jokes too ! Thank you so much for letting us stay! We had an amazing time! I will remember this tripthe 2 of you, and Sasha forever. You´ ve spoiled us all week. We´ ve had a wonderfully, relaxing and fun vacation. 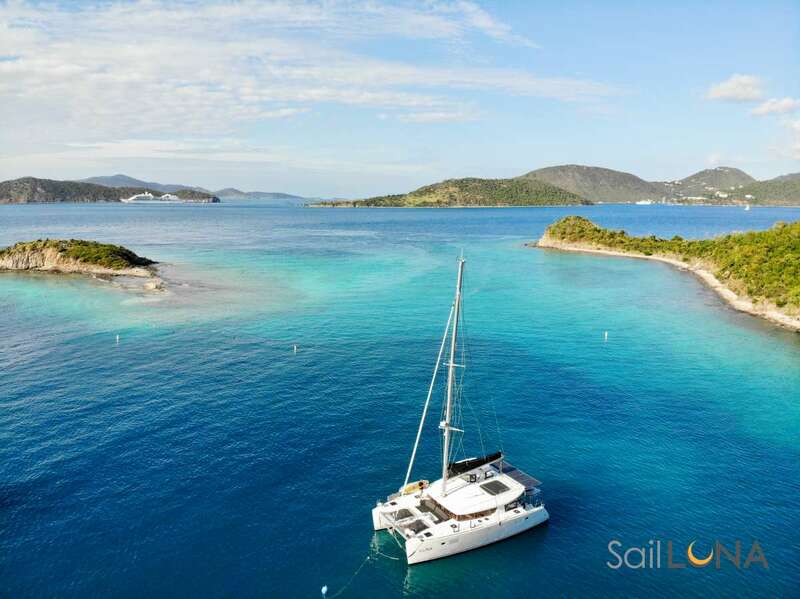 You´ ve set a high bar for all future sailing get aways. Thank you for taking such great care of us - from wonderful meals to spectacular swims. Look forward to sailing with you again! The food was over the top! We swam with the turtles and fulfilled one of our long time dreams. Food was spectacular (and I am not easily impressed!). Your warm hospitality manner let me at ease all week. You always knew what we needed before we needed it. Thanks so much for a fantastic week on Sasha. We had a great trip enjoying the beautiful BVI´S with our friends. What an amazing week! Sasha is beautiful- so clean & enough space for the 6 of us to not drive each other craszy. The meals were healthy and fabulous beyond what we make at home ! and most of all you were so fun and accommodating to one every need. We hope to come back again soon ! Thanks kindly for the updates and sharing the guest comments. I have had the chance to speak with both Laura and Rob this week. Dana and I have only had a brief e-mail since he was continuing on to Trinidad. Everyone seems extremely happy with their charter onboard S/V SASHA. They were impressed with the condition of the vessel and your ability to meet the dietary needs of all guests with such fabulous food and smoothly run logistics for the entire trip. They were very impressed with the hand rolled sushi, lobster dinner and fruit plates in the morning. Most importantly they all loved you as crew and were impressed at the operation you run and the comfortable environment you provide. Most were slightly intimidated by Sylvia’s minimal English upon arrival but were very pleasantly surprised at how easily and enjoyably the trip went. This just goes to show what a strong team both of you are. Should you want a recommendation at any point either myself or one of the charter guests would be more than happy to provide upon your behalf. Thank you for all of your efforts and showing my clients a fabulous time in the Virgin Islands. I hope to work with you again in the near future. Keep up the great work! Trs belle semaine sur ce magnifique bateau. Un grand merci !! Un grand merci pour cette merveilleuse semaine un peu courte, o vous nous avez fait dcouvrir les BVI´S!! Votre gentillesse, votre discrtion ont contribu faire de ce sjour, un moment inoubliable!!! Merci aussi d´avoir initi les enfants la plonge mme s´ils n´ont pas crois de requins!!! Enfin, merci notre ´chef toil´ grce qui je vais prendre de bonnes rsolutions pour ce dbut d´anne!!! Bref a Big Thank You ! Wow!! I´am afraid will be unable to express the level of service we were given because 1st class is not even close. Jim, Sylvia work together like clockwork, anticipationg every need before it is even thought about. Exceptionaly knowledgeable about the Grenadines. And the food was outstanding ! One of the best dives we ever been a part of. Thank you to you both and we hope to sail with you again! The girls are really sad to be home and several times yesterday they told me how much they miss you. Thanks for such a memorable family vacation. Look forward to keeping in touch and to our next one with you. I am already sending info to friends on you and your boat. You can use some of our photos. . Thanks again for the good time we had together. Thank you for your wonderful hospitality onboard the Sasha. We all had a wonderful time and enjoyed your beautiful dishes, snorekeling and fun in the water ! Merci, gracias, thank you from all six. We ate great meals, had lot of laughs and lifelong memories. S. W. A. L. A. G.
What an amazing adventure this week has been. Thank you for all your kindness and hospitality. Sasha is beautiful and you take such good care of her. You both exceeded our expectations. We wish you all the best and hope to sail with you again ! Merci ! > Our grown kids and my husband had 3 fantastic dives with Sylvia and Jim, both are very professional divers and they all felt very safe with them. > Their cooking (especially Jim´s) was awesome, they both made delicious meals and with my hungry crew every plate was cleaned. > Can´t say enough good about the week. We would certainly love to sail with them again in the future. Only downside was the Tortola pickup, would rather have Redhook or Charlotte Amalie. > We had a fabulous week with Sylvia and Jim. They are very special people and are actually missing them right now. We have such a GREAT time on Sasha with great foof & company. We enjoyed our diner and busy advertising. You have been excellent hosts. Our few days together was filled withsuperlatives amazing, awesome, wonderful! My thanks to both of you for makingsure we went everywhere on our list as well as diving, kayaking andsnorkeling every day. You and Sasha are the best ! K.
Thanks to you for an amazing week. We loved your hospitality, your uncredible cuisine, the amazing locations to moor and the most beautiful boat. We appreciate this precious time being able to spend all together and you both made this happen with so much fun. We were all looking forward to a great vacation but Jim, Sylvia and Sasha exceed all of our expectations ! Before this trip, we liked diving but now we love it! Thanks to you ! To our dear friends Sylviane and Jean Yves, We have had incredible vacations, we will remember forever our week on SASHA. Thank you for everything you have done in order to provide us an exceptionnel experience. A lot of laughs, some good meals, good wines and don´t forget Captain Jim´s famous ´painkillers´. We had a lot of fun. Thanks for your patience training us how to scuba dive. We promise that next time, we will stay very close to each other, mostly you know who !!! Dear Jim, our captain and great chef ! The words can not describe our one week experience on this awsome catamaran Sasha ! At the very beginning, we had no idea what to expect, since sometimes looking for a first time on charter can be risky like rolling a dice ! But from the moment we had met you at noon at Village Cay Marina restaurantand start talking, we knew we were going to have a great time. We did not know we will have a time of our life ! This was the best vacation ever ( !) and we are travelling at least 6 times a year all over the world !!! BVIs are beautiful, but your hospitality, your incredible cooking and of course scuba-diving training are simply unforgettable ! Its too bad we did not have opportunity to meet Sylvia. Thank you again. Your welcoming good nature captured us from the beginning. Thanks for reintroducing me to scuba after a long respite with confidence and the perfect mix of adventure and safety. You are a great dive buddy. Everything from disco night, special food accommodating, amazing desserts morning, noon and night. Felt natural, like we were home away from home wandering from island to island. Hope to meet and join you again in the future. You were engaging, have a great sense of humor, a great chef, fun to be around. Notre sjour sur le Sasha sachve. Vous nous avez fait vivre un joli rve nous quatre. La plonge en bouteille a t un moment fort Vous tes disponibles, joyeux, patients et avenants. Restez comme vous tes ! Merci pour tout. Our first trip on Sasha and for me to BVI was magnificient ! You both make each island stop an adventure, full of fun ! We enjoyed some of the beautiful spots you could share. Sailing was one of our favorite parts, especially the night sail. Oh, and every meal better than the one before. Thanks so much for making this a special trip ! 1. Was the crew friendly and accommodating ? Excellent Very friendly and accommodating noticably more than previous charter (which was good). 2. Was the yacht comfortable and clean ? Yes- sleeps 6 in comfort and rooms & bath were cleaned, beds remade throughout trip. 3. Was the yacht well ventilated ? Yes We had no need for A/C throughout. 4. Was the food good and well presented ? Excellent They are skilled French chefs, with variety to content, sizable portions and attentive to individual tastes presentation was restaurant quality. 5. Did you like the area you sailed ? Very much good variety in harbors and locales with plenty of activity, especially with diving & snorkeling. 6. Additional comments on your charter ? Jim and Sylvia provided a 5-star service in all facets of the charter food, accommodations and activities. Their expertise in sailing and diving made the trip comfortable and rewarding for everyone. Their willingness to accommodate varying preferences, nedds and changes was refreshing. I would heartily recommend Jim and Sylvia to anyone wanting to charter. If your needs include diving and snorkeling, they should be your first choice. Because they are fairly new to BVI, Sasha with Jim and Sylvia may not be that well known that will soon change, they are truly a hidden gem. Merci pour une semaine merveilleuse. Les plonges incroyables avec les tortues de mer, les barracudas, les parrot fish, les oursins, les trumpet fish. En plus, les repas dlicieux, les parties de carte et loccasion de se dtendre entirement !! Vous tes adorables et si gentils ; nous esprons que vous aurez une bonne anne avec tous les gens qui auront la chance de voyager sur la belle Sasha ! We´ve enjoyed a fabulous journey with Jim and Sylvia. The food was delicious, Jim has turned into a magician in the kitchen ! Our introduction to scuba diving was mastered by Sylvia with great patience and enthusiasm.